Ahmed Elmohamady is a right-sided player who spent the 2010-11 season on loan at Sunderland from Egyptian club ENPPI of Cairo. Blessed with pace, power, crossing ability and providing an excellent aerial threat, Ahmed impressed for the Black Cats in the early part of the campaign when he featured in a wide midfield role to begin with before switching to right back. He began his senior career with Ghazl El-Mehalla before joining ENPPI in June 2006. Ahmed made his international debut for Egypt in August 2007 and has now made over 40 appearances for his country. 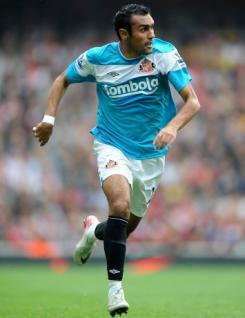 Ahmed made a permanent move to the Stadium of Light in the summer of 2011.